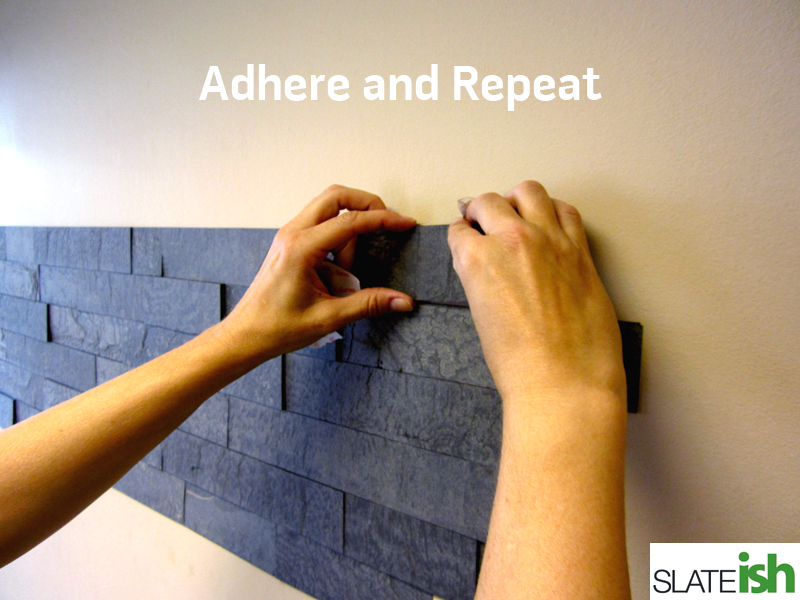 The wall surface you are attaching Slate-ish tile to should be painted a dark or similar color tone. This will allow for any small variation in tile size or movement in level installation of tiles and not show any small gaps. Mark Level lines every few feet up the wall to insure that you are installing the rows straight on the way up. We recommend clear silicone adhesive for most installations. If adhesive squeezes out between tile, do not wipe off – simply allow to dry and use a utility knife to cut away any visible excess. If the caulking does get rubbed on the tile, or transferred from your fingers, allow to dry and use a rough grit sandpaper to rub away. Starting at the bottom of the wall – either at the floor or on top of base trim, lay one row of tile at a time. You can apply the adhesive directly to the wall, but we have found that applying it to the back of the tile give you more control over placement. Start applying tile at one side, and when you come to the end of the row, mark the last tile that will need to be trimmed. Tiles can easily be cut with standard wood-working tools. We recommend a Miter Saw, Jig Saw or Table Saw with a sled. Alternatively, you can overlap the tiles to minimize or eliminate cutting – be sure that the thinnest tiles are adhered to the wall surface – this will allow you to adhere a tile to its surface with little chance for visibility and the best surface for adhesion. Begin the second row of installation, making sure to stagger tile placement so that your joints do not line up. Select tiles to vary as you apply them to the wall, in both length and thickness. This will allow for the most uniform overall installation. 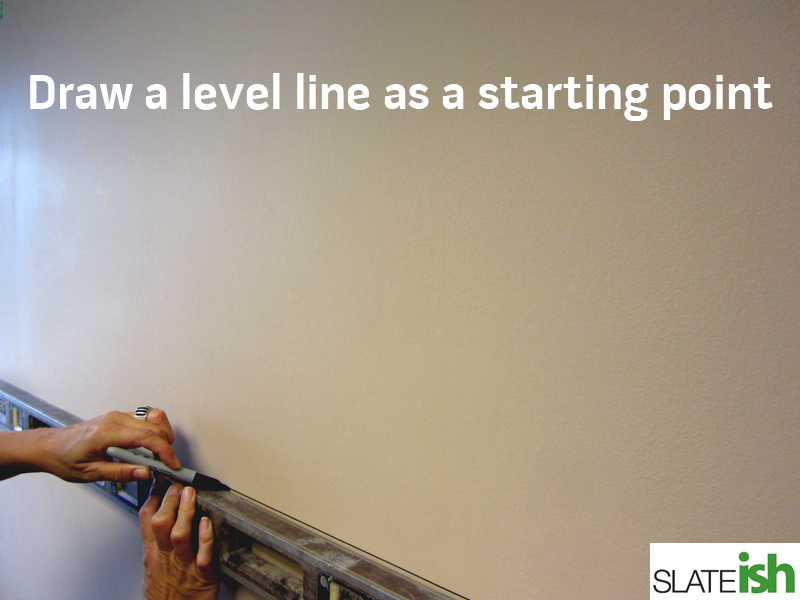 Make sure that you are lined up to your level lines as you work up the wall. If you are off-level, make small adjustments to spread out small gaps in each row. This will minimize the visibility. You can use painter’s tape to hold tiles in place as they dry. Once all tiles have been installed, allow adhesive to dry. After adhesive is dry, cut away any caulking visible in between tiles. Surface treatments are optional, and will darken the color of the tile significantly. These surface treatments can be spray on polyurethane (matte or satin finish) or oil based rub-on wood finishes. Test a tile for the finished look before applying to all tiles. Surface marks that cannot be removed with soap and water may be removed with acetone, including grease, permanent marker and paint. Surface dust with a dry brush or brush vacuum attachment. Only the thinnest tiles can be "easily" cut with a hand-saw, as Slate-ish tile is VERY hard. If power tools are unavailable, you can overlap tiles to eliminate the need for cutting. Simply take the thinnest end of any given tile, and adhere the next tile over a portion of the thin piece. Your tiles must be of appropriate thickness to make this work well! For the best visual installation, vary the tiles in thickness as you place them - thin next to thick will be the most dramatic. If some of your tiles have a smooth surface face, or spots of color - this is the BACK of the tile!